Just after Trans-Trax published its ideas about a proposed Reading - Heathrow link, another idea has been floated; that of a rail link between Heathrow and Gatwick airports. This was firstly mentioned on the BBC and Daily Mail(including a map proposal) on 8th Oct. followed by Breaking Travel News. Even London Mayor Boris Johnson had his pieces to say to support the scheme in the Evening Standard (10th Oct.).and Daily Telegraph (11th Oct). As Trans-Trax has proposed in this last (Reading - Heathrow) post and in other previous ones, it seems that the UK Government is taking on board some of the ideas expressed in this blog.We cannot but be satisfied. The basic premise is to build a new line from Reading, through Heathrow and Gatwick to Ashford where it would connect to the Channel Tunnel. This idea is called SHSL, published 24th Feb.2010. It is redundent to explain all the implications as they have been well looked at in the previous posting Reading - Heathrow Rail Connection (6th Oct.2011), amongst others. The interesting thing is that the idea has been floated, which is the first stage in the process of convincing voters. However, it must be mentioned how the government goes about this because it is not crystal clear.The problem with governments is that they do not tell you the whole truth, usually because they are afraid of upsetting too many voters at the same time - the old addage applies - divide and rule. To understand this you have to look back at other policies.Why does the government want a HSR2 spur into Heathrow? To add travel time on its way north? To connect to HSR1 through that bottleneck of inner London? The idea on its own is absurd. The results would never justify the cost. However, if you plan to have direct trains from the airport to other cities then the idea falls into place. Run trains from Heathrow to Manchester and Leeds so the reduction in air traffic releases slots. With the resulting reduction in rail journey times then there would be knock-on effects for traffic to Newcastle and Scotland, with a reduction in demand for air transport. Government thinking is that more slots would be freed up. As a result the need for a third runway disappears thus justifying the decision. Unfortunately, such thinking is extremely simplistic, and as such this blogger considers it short-sighted and erroneous. The connection Heathrow - Gatwick is part of the same thinking. Provide a fast link between the two airports and you, thus, reduce the need for competing flights from both airports. You also treat Gatwick as another terminal and so integrate the airport into the workings of Heathrow, and subsequently you are able to use any spare capacity there for long haul slots. 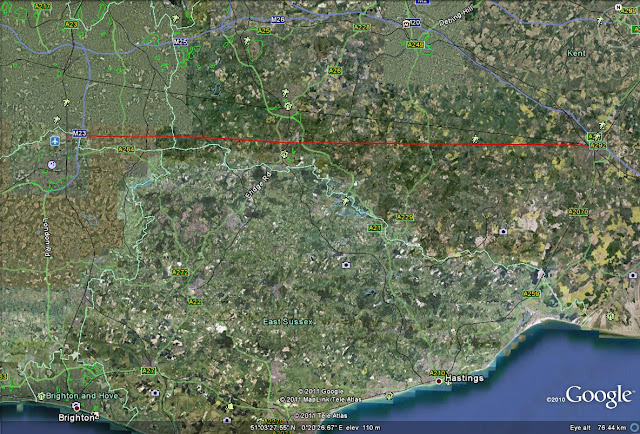 What the Government does not say is that if you continue the rail line the 73 kms. due east across open country you arrive at Ashford to link up with the Channel Tunnel (This will be done eventually if intial reactions are not wholely negative). As a result you would be able to offer direct train services from both Heathrow and Gatwick to Paris, Brussles, Rotterdam, Amsterdam, Düsseldorf, Cologne and even Frankfurt.This is the sort of service the Government wishes to emulate which already exists in airports such as Geneva and Zurich. How many slots would then be released for other services? The Government would consider very many but the real number would probably not be so many in an ever expanding market. Take the idea further and connect the the Gatwick - Heathrow link through T4, T1/3 and T5 to the recently mentioned Heathrow - Reading link. Then you have your connections to the West and South Wales(via the GWML), but also to Oxford, Birmingham and destinations northwards. Pie in the sky? I do not think so. It must be mentioned that not everyone is in favour of a Heathrow - Gatwick rail link. Willie Walsh, the chief executive of IAG(parent company of BA), was the quickest off the mark, in the Daily Telegraph (9th & 10th Oct), Reuters(9th Oct.), and Railnews.co.uk(10th Oct.) rejecting the proposal. This was followed by Breaking Travel News (10th Oct.) where the Board of Airline Representatives (BAR UK) in the name of 86 airlines rejected the proposed rail link. To understand this it should be said that the airlines are concerned about the lack of runway capacity in South East England, especially in the places into which they wish to fly. The rail link, itself, they would accept and even welcome, but certainly not as an excuse to not deliver on a new third runway for Heathrow and/or a new second runway for Gatwick, or any other new runway at Stansted or Luton. The Government is thinking that the slots released would satisfy mid-term future demand. On the other hand the airlines know that you are making the airport network more attractive so potentiating demand thus annulling the sorted after effects. The costing of the project is of very high importance because it would obviously fall on the taxpayer while the third runway at Heathrow was to be paid for by its users, the airlines, and not the general taxpayer. However, many projects with a European perspective have been financed in large part by the EU. It all depends what happens to the EU cohesion fund when it is up for renewal in 2013. The position of this blog is clear. On its own the link is expensive and hard to justify, even though a rail link between the two airports is more than welcome. If fact it would take off the roads 4 coach services per hour in each direction - meaning about 12 coaches in total with what that means in diesel consumption and exhaust fumes. Add that to the savings made on the Reading - Heathrow service (7 coaches) and the savings become considerable. The important thing is to put this into context. 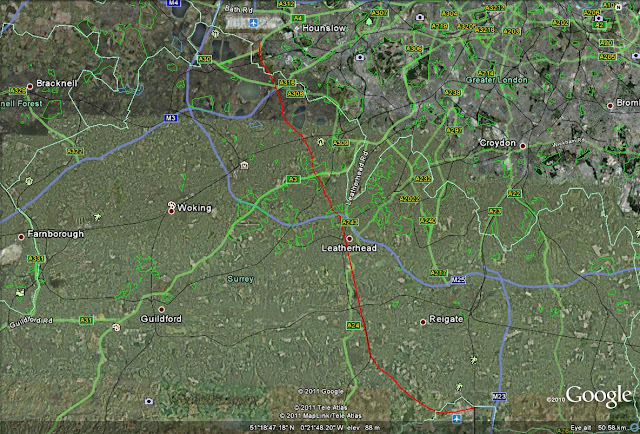 A Reading - Heathrow link and a Heathrow - Gatwick link seperately are illogical. A Reading - Heathrow - Gatwick service makes sense. This would connect the two airports but also open up connections from the west and north without funneling more traffic through that bottleneck called London. To extend the line to Ashford is the next logical step, not just for local services to Ashford(with passing points on the way), itself, and on to Margate, but also long-haul services directly through the Channel Tunnel to continental Europe. The possible variations of services are numerous. 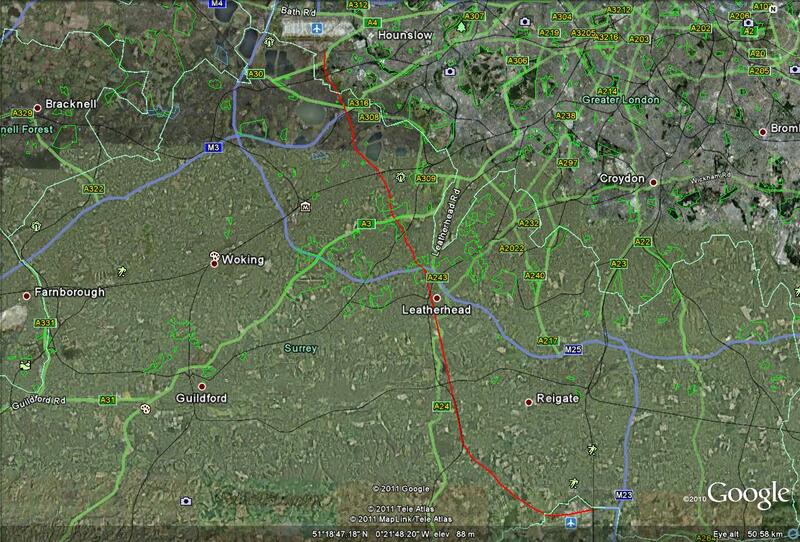 NB: If the name proposed for this new rail link is Heathwick, then is the Reading - Heathrow rail link Readrow? Awful and stupid names.